What do you wear for the run of your life? Pamplona’s traditional Running of the Bulls costume of course! Like any great festival, the San Fermin Festival in Pamplona, Spain is surrounded by legend and tradition. A legend of martyrdom and community tell the story of how Pamplona’s most famous festival came to be, leading many to theorize that the traditional Running of the Bulls outfit is meant to symbolize blood. No one knows exactly when the red scarf, known in Spanish as the pañuelico, became a part of the unofficial costume for the running of the bulls and the festival. But today a red sash is worn by practically every participant and festival-goer. To be fully immersed in the festival’s atmosphere, you just need to suit up in your red and white costume. Once the fireworks and the Chupinazo rocket goes up, marking the start of the festival with a bang, simply tie your pañuelico rojo around your neck and you’re already a part of the festivities! 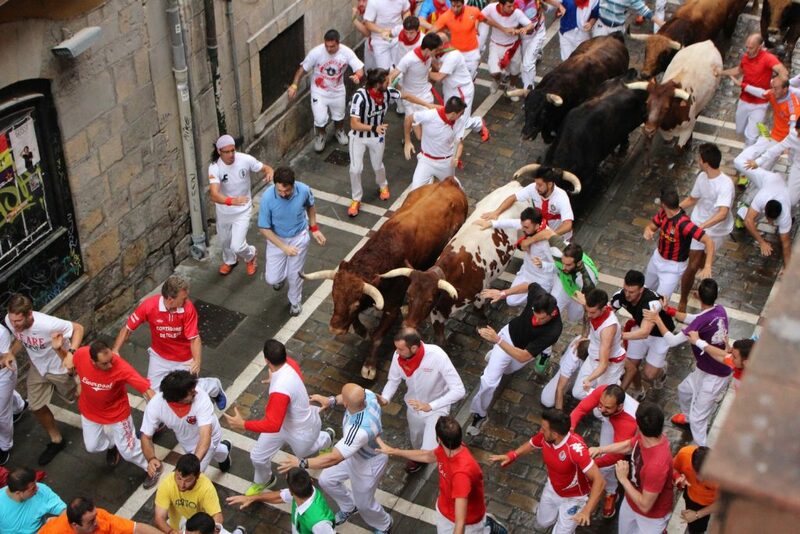 The history of the Running of the Bulls festival begins in Pamplona during in the 3rd century. San Fermín, the first bishop of Pamplona, was beheaded in France, dying a martyr’s death for preaching his beliefs. After dying as a martyr, Bishop Fermín became San Fermín, the saint who is now patron of Navarre, boot makers, bakers, and wine traders. Interestingly enough, the association with bulls and red arose out of a false rumor. Though San Fermín was beheaded, the local populace believed that he had been tied by the feet to a bull and dragged to his death. This rumor lead to a martyr status for San Fermín. 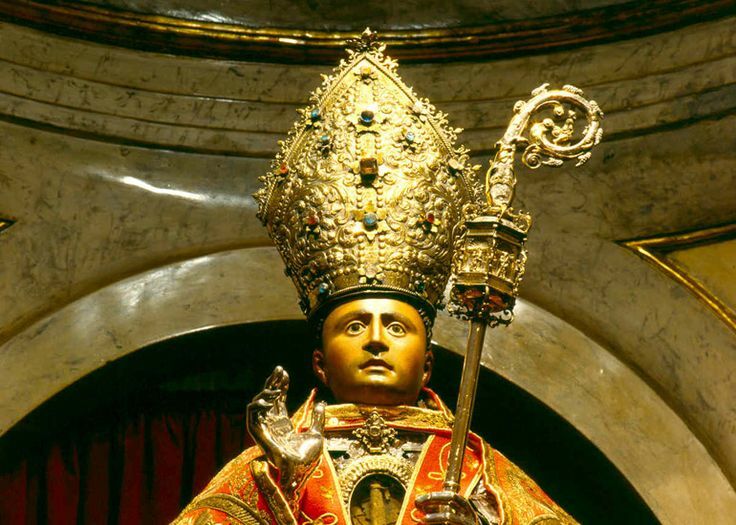 Common practice for priests at the time was to wear red when honoring fallen fellow saints, the red color symbolizing his spilled blood. 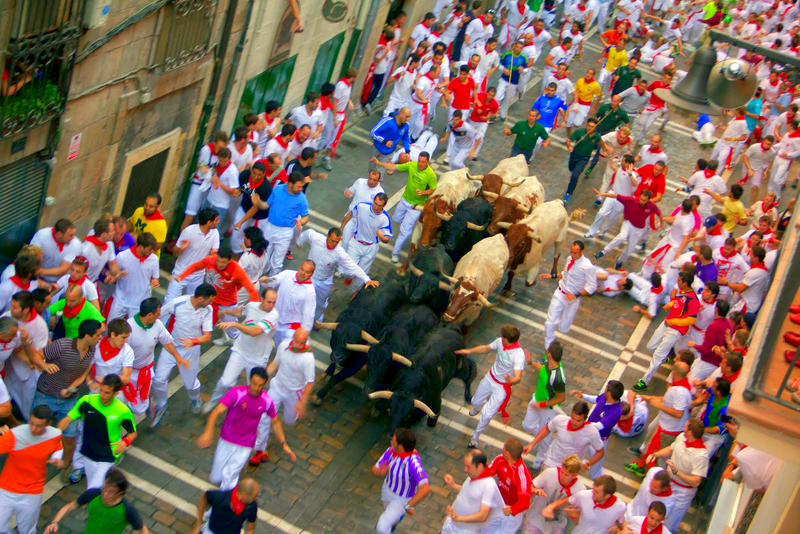 Although the correct history of Running of the Bulls is now widely accepted, bulls are an inextricable part of the celebrations and festival participants still honor the festival’s namesake saint with the traditional red scarf. The purpose of Running of the Bulls today remains to honor San Fermín. 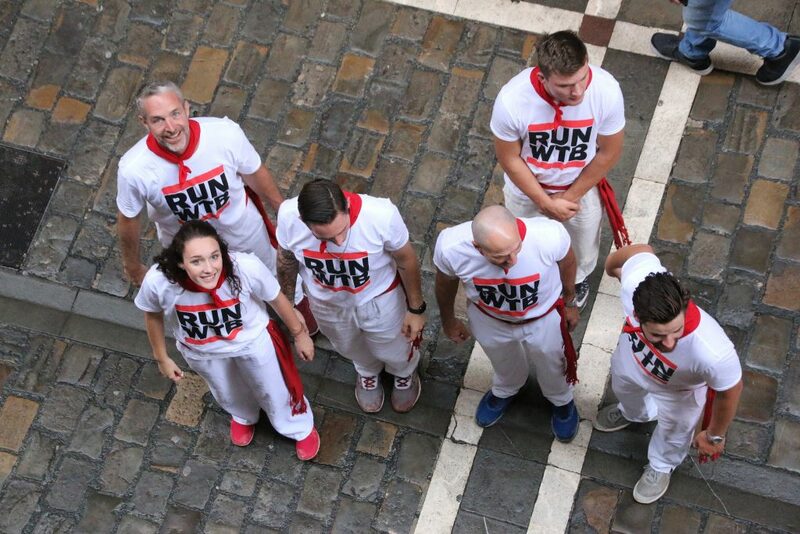 The tradition of wearing white clothes and a scarf of red as a running of the bulls outfit is still upheld by almost everyone in the city, and is the unofficial costume for the run and the festival. A tremendous sea of red and white consumes the small city of Pamplona for the entirety of the festival. 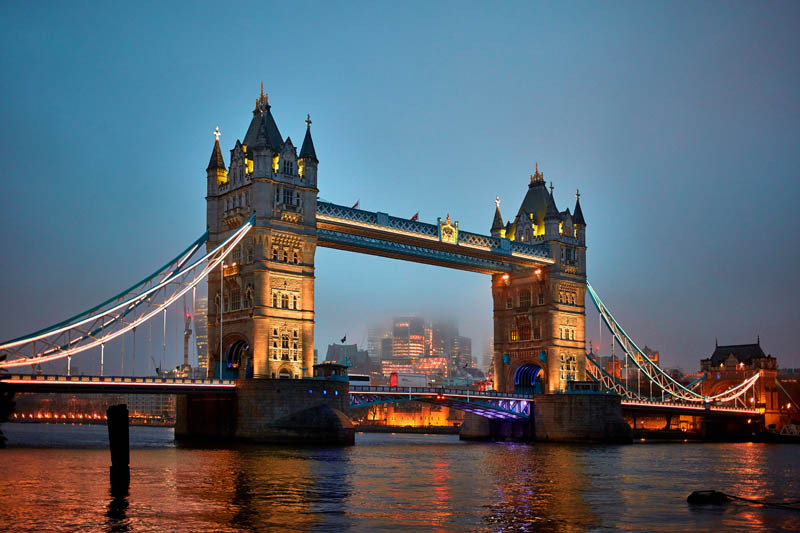 The awe-inspiring sight is only made more remarkable when you become a part of it yourself. While it’s not mandatory to dress up in the traditional white attire with red accessories, it certainly adds to fun, and you’ll probably feel a bit left out if you don’t. The runners, or mozos, traditionally dress in white pants and shirts with red bandanas around their necks or waists. But dressing up is not just for the participants in the run. Almost everyone in the city, male and female, wears the official San Fermin costume: a white shirt (well, white before being doused in sangria), white pants/skirt, a red sash, and a red neck-scarf. You really can’t go wrong in your choice of clothing, as long as it’s white or mostly white. Depending on the occasion, you can dress your outfit up or down. If you want a true fashion perspective on how to really look good in your running of the bulls outfit, read through a student’s account of dressing up for San Fermin while studying abroad. Do you have to dress up for the Running of the Bulls? Dressing up for the Running of the Bulls Festival is not mandatory, but you’ll feel left out if you don’t. There’s nothing quite like the feeling of taking part in the wild excitement and crazy crowd of people who are all there for the adventure of a lifetime. Dressing up in the traditional outfit colors automatically makes you a part of the festival, celebrating in style side by side with both friends and strangers. There is also something to be said for the feeling of accomplishment when, at the end of the day (or at the start of a new one), you’ve turned those white clothes red with sangria. 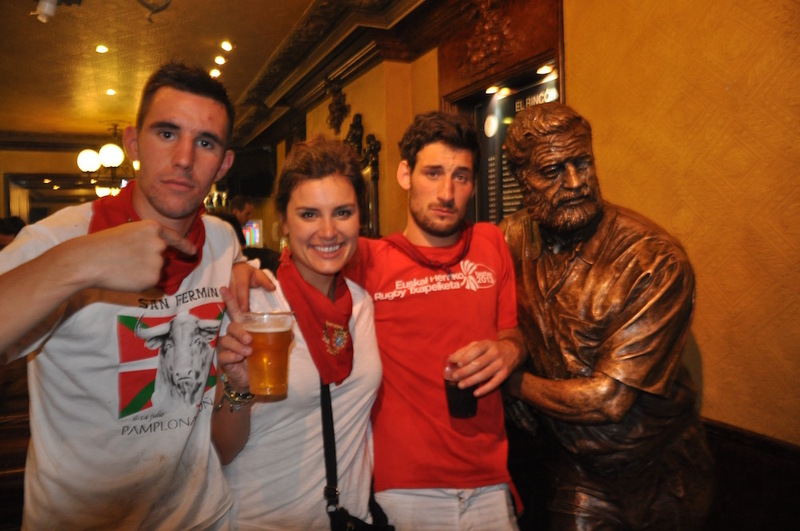 Can you buy a Running of the Bulls outfit in Pamplona? You don’t need to worry if you forget to pack your scarf or didn’t bring enough white clothing. There’s a shop on almost every street corner in Pamplona selling everything you need for a traditional Running of the Bulls outfit. Because it’s standard to get drenched in sangria during the festival, local shop owners have plenty of stylish options for when you need to replace some pieces of your costume, and they make sure that you don’t have to look very far. 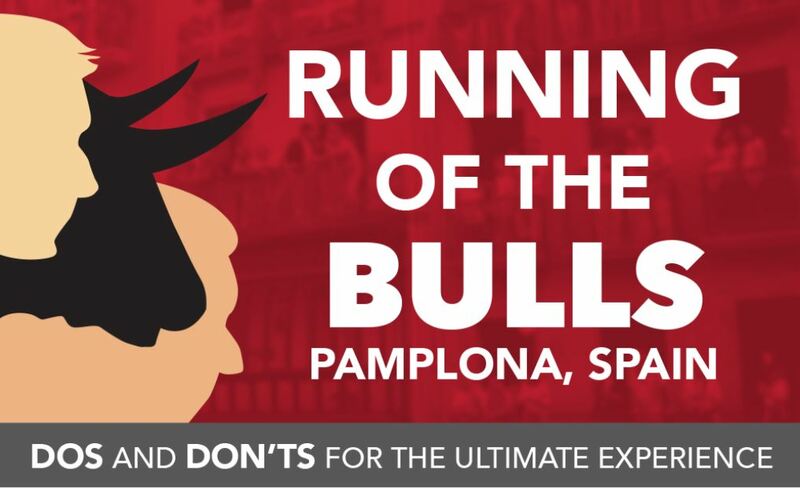 You’ll be able to buy Running of the Bulls merchandise all over Pamplona during the festival. Don’t be scared of getting your white clothes dirty, it could very well be your badge of honor. Truthfully, the more ripped and sangria stained your clothes, the more fun you probably had and the better stories you’ll have to tell. A costume that looks like it went through battle also gets you the respect of other die-hard festival goers. Standing out can also be a good thing, and as the popularity of social media has exploded in the last decade, there has been a little bit of a shift of attire during the actual run of the bulls. With each run being broadcast live all of over the world, some run participants have begun to wear more noticeable shirts such as soccer jerseys and neon, and we encourage adding something unique of your own to complete your running of the bulls costume. Anything extra you wear will help you when you’re trying to point yourself out in pictures to your friends, but be careful that it doesn’t slow you down, whether you’re running or partying. Nothing is worse than tripping over your own scarf and getting trampled by people and bulls, except maybe losing your nice stuff while bar-hopping around town. Another costume that is often seen in Pamplona during the festival is that of the cross-country traveling pilgrim, who wears an outfit of huge backpacks and comfy shoes. The Pilgrimage to Santiago de Compostela is even more famous in the religious community than the Festival of San Fermín, and pilgrims come from all over the world to Pamplona to begin the Camino de Santiago. Known as the Road to Santiago or St. James’s Trail, the route leads pilgrims to the shrine of the apostle St. James the Great in the Cathedral of Santiago de Compostela. For many pilgrims the long journey starts in Pamplona and continues west, almost all the way to the Atlantic coast of northwestern Spain, ending in the famous Santiago de Compostela Cathedral in Galicia. Since the ninth century, more than a million people have made the pilgrimage to the Santiago de Compostela, to see and pray at the site where the bones of St. James are said to have been discovered. Pamplona is the first city on the long road for many pilgrims who can be seen making the trek through the city during the festival, wearing their walking costume of very comfy shoes and very large backpacks. Why do Bulls like the Color Red? Bulls have no actually predisposition for or against the color red. They are in fact color blind to red. This misconception that the color red will send a bull into fury stems from the fact that Matadors often use a red cape (muleta) in the ring. But it’s not the color that agitates the bull and leads it to charge, but rather the movement of the cape. So you don’t need to worry that wearing a red scarf and sash will put you in any more danger of being targeted by a bull. Aside from the famous San Fermin Festival, Pamplona is an extremely worthy destination for travel on its own with surroundings of countryside and some of the best natural landscape as well as stunning historical landmarks throughout the city. Pamplona also has its share of religious sites that you can see and experience just taking a walk through the city including a Gothic bridge and cathedral. What are some other resources I can read about Pamplona and the Running of the Bulls? 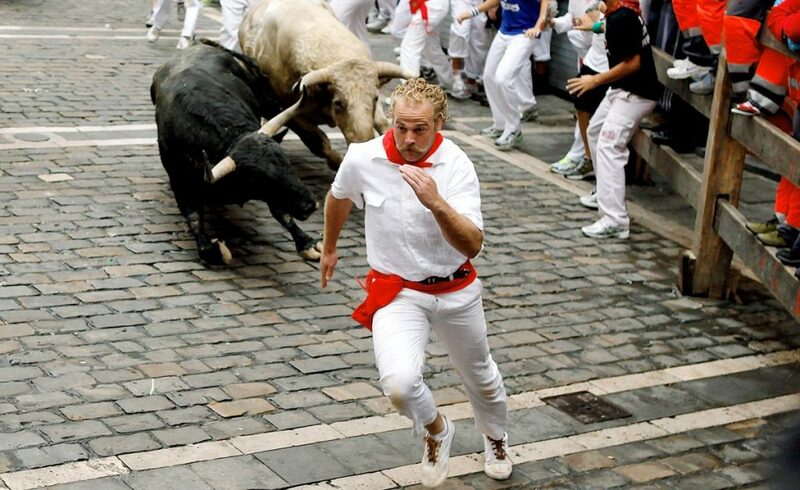 Reading through Rick Steve’s account of his experience at the San Fermin festival, you can feel what it’s like to see the Running of the Bulls firsthand. Not only is it from the travel guru himself and extremely informative, it’ll also give you a vivid taste of what it’s like at the festival, with the bulls running by, the feeling of danger, and becoming part of the crowd’s overwhelming excitement. The city of Pamplona’s tourist website also has full descriptions and lists of the best sites to see and things to do if you’re interested in the history of the pilgrimage, religious sightseeing, or the best shopping in the region. If you want to know more about the Running of the Bulls from our many experiences at the festival check out our tips for the bull run and read through our most frequently asked questions from our guests. 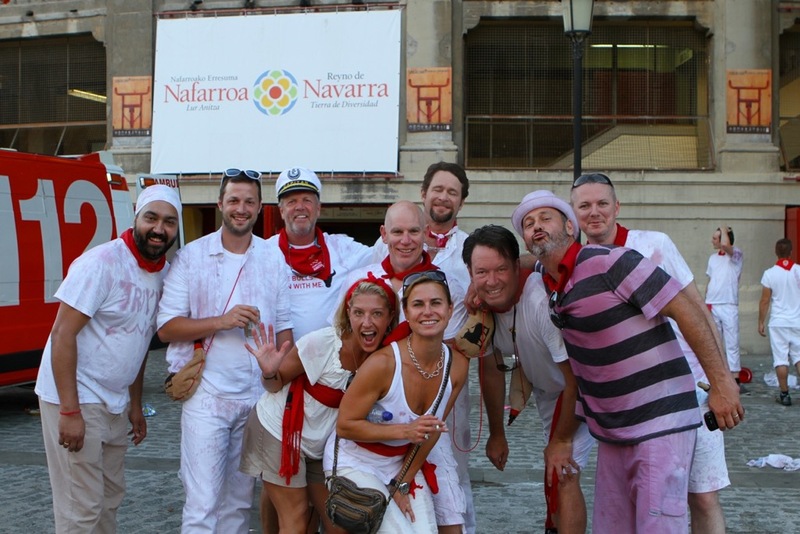 We’ve also put together a handy and informative guide to the festival, filled with everything you need to know about Pamplona and getting the most out of your trip. Download the guide below!